2. 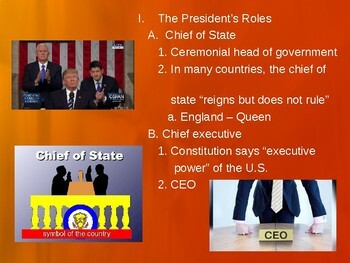 Explain how the president functions as Chief Executive. 3. 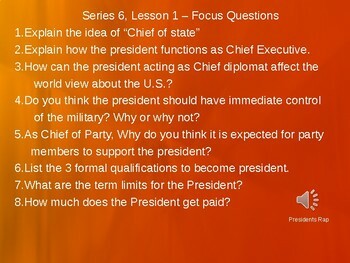 How can the president acting as Chief diplomat affect the world view about the U.S.? 4. Do you think the president should have immediate control of the military? Why or why not? 5. As Chief of Party, Why do you think it is expected for party members to support the president? 6. 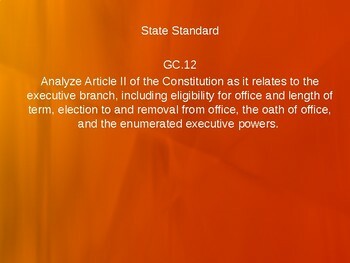 List the 3 formal qualifications to become president. 7. What are the term limits for the President? 8. How much does the President get paid? BE SURE TO CHECK OUT THE WRITING ASSIGNMENT THAT GOES WITH THIS PRESENTATION. 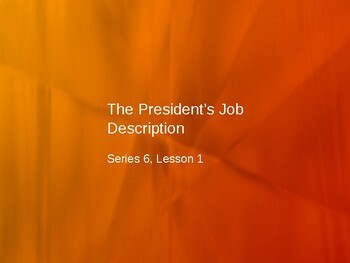 "The President's Job Written Response"